This is a reminder that Standing Silent Nation will be aired on P.O.V. on PBS on Tuesday, July 3 at 10:00 PM (please check your local listings). If you would like an email reminder sent to you, please click here and select the "Remind Me" link just to the left of the "Watch Trailer" button. I have been following this story since 2000 when the Hemp Commerce and Farming Report, now called the Hemp Report, ran a tribal press release and story about members of the Oglala Sioux Tribe planting industrial hemp at various locations on the Reservation. There was a short follow up in Issue 14 DEA raid Pine Ridge: hemp lost. Visit the P.O.V. website and watch additional video clips not included in the film, including a brief history of hemp production in America, scenes from a protest that the White Plume family participated in during the 2003 reenactment of the Lewis and Clark expedition and an expanded interview with former CIA director James Woolsey on the laws surrounding hemp production in the United States. Watch or listen to an interview with filmmakers Suree Towfighnia and Courtney Hermann. Host a P.O.V. screening party at your house, download our discussion guide and talk about the film with friends and neighbors. Teachers, access lesson plans and free video clips! The story took many turns and twists. Indian Country Today covered story in depth, but many of the stories are gone from their archive. One that is left is Hemp could be crop of the future. Another is S.D. family seeks the right to grow hemp. There is an archive of information and stories on the Natives Unite hemp page. Vote Hemp has an archive of court documents on their Legal Cases White Plume page. This is an amazing story and is worth being discussed. PBS has provided a wealth of information to go along with the film including a Discussion Guide, a Lesson Plan, and an online PBS Discussions Board among other offerings. 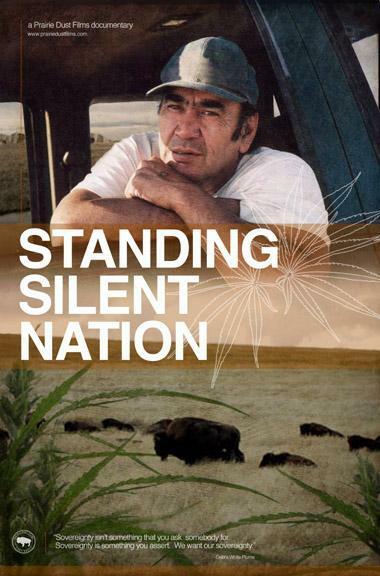 Please remember to watch Standing Silent Nation will be aired on P.O.V. on PBS on Tuesday, July 3 at 10:00 PM (please check your local listings). Most of the leads that I do for the Vote Hemp Weekly News Update relate to hemp news. Some are a little more personal. This lead was to be one of those, but it ended up being too personal. So, I am making it a blog post here instead. Late last month my grandfather passed away at the age of 98. He was a very important person in my life and I would not be where I am now without him. I live where I do and do the work that I do because of his influence. Among many other things he loved to build boats and tell stories. "Grandaddy, please tell us a story" was a phrase that we all knew well. I feel very lucky to have recordings of my grandparents. Here is an MP3 of his story The Hanna about a model ship that he built that's in the Smithsonian. The other two voices are my grandmother, who has also passed away, and my sister, who recorded it in 2002. The schooner Hanna was the first ship in the U.S. Navy and like most ships of the day she was probably rigged with Russian hemp. Alfred W. Crosby, Jr. wrote in America, Russia, Hemp, and Napoleon "Without Russia's hempen hawsers and rope, her flax sails and fittings and fastenings made from her iron, our sailing vessels would have been immobile piles of lumber." The first hemp product that I ever bought was some Merry Hempsters lip balm that I got at Whole Foods in Berkeley in the late 1990's. I really wanted a product that was not made out of petroleum products. I didn't really think much about it as I did not have any negative connotations about hemp. After I moved to Maine in 1999 my grandfather and I were having a talk about something, probably boats, and he mentioned something to me about hemp. I wish that I could remember what it was exactly, but I can't. Anyway, I started doing research on hemp on the Internet. There was a lot of good information and a lot of dreck. Nothing was all in one place, though. I started bookmarking sites that were useful. I decided to start my own industrial hemp Web site and as luck would have it the domain name industrialhemp.net was available. Originally the site started out as a bookmark dump as my collection of industrial hemp related links grew so large that my Netscape browser bookmarks pull-down would not work. IndustrialHemp.net went live on April 28, 2000. I became a partner and webmaster for The Hemp Report on January 19, 2001 and I continue to serve in that capacity. I was elected to the Board of Directors of Vote Hemp on September 14, 2003 and I have served Vote Hemp as their National Coordinator and now as National Outreach Coordinator. Please click here to read the Vote Hemp Weekly News Update for this week. The archives are here.